(10:50 a.m. BST) -- Carnival Corporation has signed a memorandum of agreement with the Fincantieri shipyard in Italy for the build of Cunard's fourth ship -- a next-generation vessel -- that is set to be the largest in the line's fleet (based on passenger capacity) when it debuts in 2022. The 113,000-gross-tonne ship will carry 3,000 passengers and become the first new-build vessel for the line since Queen Elizabeth debuted in 2010. Carnival Corp.'s CEO Arnold Donald said: "We are very pleased to announce a fourth ship for our immensely popular Cunard brand, which is also one of the most legendary brands in the entire vacation industry. "Cunard offers a fleet of unrivaled vessels and one of the most unique travel experiences in the world, which together create an enchanting and memorable vacation for our guests. While today’s news helps drive Cunard’s overall strategic growth plans, we also look forward to launching this next-generation cruise ship to help meet increasing global demand and entice even more travelers to explore the Cunard experience." Donald added: "Fleet enhancement is an important part of our ongoing goal to exceed guest expectations. This includes replacing less efficient ships with more efficient vessels over time as part of our managed capacity growth." Cunard is currently two thirds through a fleetwide upgrade programme that saw $132 million spent on the refurbishment of Queen Mary 2 in 2016 and $40 million spent on Queen Victoria earlier in 2017. Queen Elizabeth is expected to undergo a similar upgrade in 2018. Cunard's senior vice president Simon Palethorpe said: "We have only recently marked the 50th anniversary of one of Cunard's much loved ocean liners, the legendary QE2. What better way to celebrate her important role in Cunard's past than by announcing our commitment to Cunard's future with the commissioning of a new ship. "Cunard offers unrivalled luxury ocean experiences and the new ship firmly underpins our plans to continue our growth across international markets." 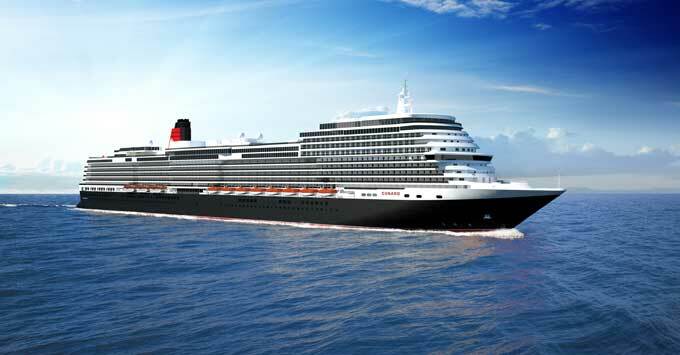 Cunard has revealed few details on the as-yet-unnamed ship, but the line has said more will be announced in 2018.